Auditions for 2019 Performing Members! Want to pound away on a big drum? Move in time and in sync with ten other drummers on a big stage? Learn about taiko, odori, fue, narimono, minyo and their role in the folklore of Japan and North America? 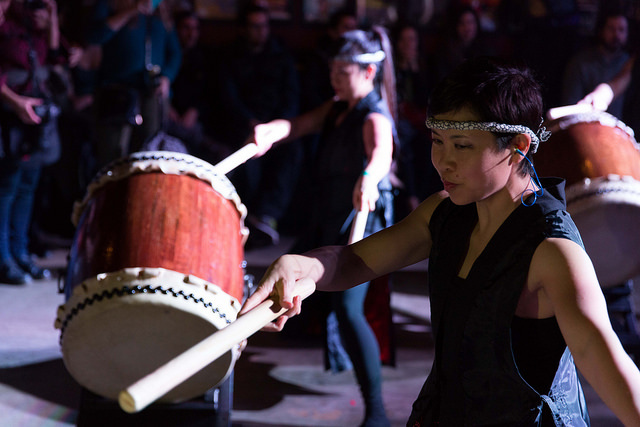 Seattle Kokon Taiko, the original Japanese American taiko group in the Pacific Northwest, is holding open auditions for new members! Previous taiko experience or at least one beginner class with Seattle Kokon Taiko is required. Applicants should have a strong sense of rhythm, grace in movement, expression of ki (spirit/energy) and the time, energy and commitment to develop into a taiko performing artist. The audition process consists of three elements: a written application, a hands-on audition which will include coordination exercises, drumming drills and demonstration of the song “Matsuri” and finally a face to face interview with members of SKT. We try to minimize stress in the process, but please note that applicants may be eliminated at any step along the way. We do not guarantee that any applicants will be accepted this year, but if you can demonstrate some “taiko potential”, we can train you. Those accepted through the application process will enter a 6-month apprenticeship for training and assessment, with final approval for full membership pending successful completion of the apprenticeship program. To help you prepare for the audition, there will be a “Matsuri” review for applicants on Sunday March 24th from 12pm – 2pm. Applications are due by Thursday March 28th. The group hands-on audition session will be held Sunday March 31st 12pm-4pm. To apply, please download and fill out the application form below, and send as an attachment to elist.seattle.kokon.taiko@gmail.com. If you have any questions, please email us at the same address.